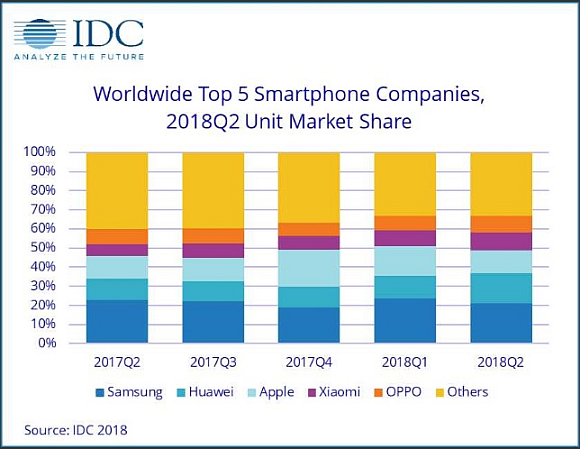 IDC has just released its global smartphone shipment numbers for Q2 2018 and there’s a major shakeup in the top 3. 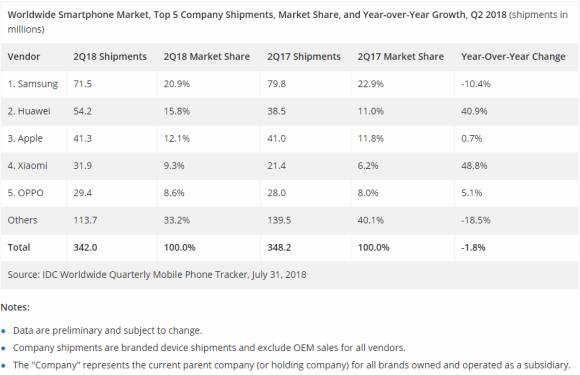 While Samsung still dominates the #1 spot with a shipment of 71.5 million units, Huawei has overtaken Apple for the second spot and they command a market share of 15.85%. 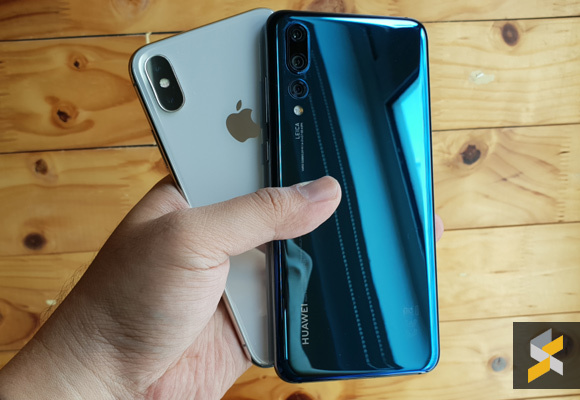 Between April to June, Huawei had shipped a total of 54.2 million phones versus 41.3 million iPhones by Apple. This is followed by Xiaomi at 31.9 million units, while OPPO is still at #5 with 29.4 million units. It is interesting to point out that overall global smartphone shipments have declined slightly year on year for the same quarter. There are a total of 342 million smartphones shipped last quarter versus 348.2 million units shipped in Q2 2017. Among the top 5 brands, Samsung had declined by 10.4% while Xiaomi recorded the highest growth of 48.8%. According to IDC, Samsung had experienced slower sales due to intense competition in the high-end segment. They are expected to catch up after the release of the Galaxy Note9. For Huawei, this is their first time to overtake Apple in IDC’s global quarterly tracker. They added that there’s strong demand for their flagship P20 series and they have also enjoyed strong sales for their honor sub-brand. Although Apple had slipped to the 3rd spot, their iPhone X still remains their top seller in many markets. You can check out the full report by hitting the source link.